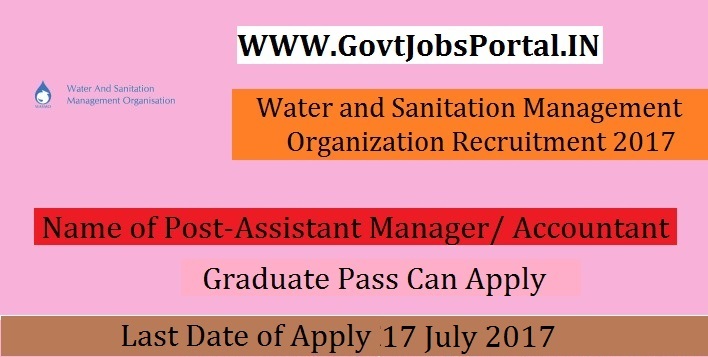 Water and Sanitation Management Organization is going to recruit fresher candidates in India for Assistant Manager/ Accountant Posts. So, those candidates who are willing to work with this organization they May apply for this post. Last Date of Apply 17-July-2017. Total numbers of vacancies are 77 Posts. Only those candidates are eligible who have passed BE (Civil) from recognized university minimum second class with relevant working experience of minimum 1 year OR MSW / MRS/ MA in Social Work in Rural Development/ MA in any Social Discipline /Post Graduate in Rural Management from recognized university OR B.SC (Chemistry/Microbiology) from recognized university. Indian citizen having age in between 18 to 35 years can apply for this Water and Sanitation Management Organization Recruitment 2017. Educational Criteria: Only those candidates are eligible who have passed BE (Civil) from recognized university minimum second class with relevant working experience of minimum 1 year OR MSW / MRS/ MA in Social Work in Rural Development/ MA in any Social Discipline /Post Graduate in Rural Management from recognized university OR B.SC (Chemistry/Microbiology) from recognized university. What is the Process for Selection this WASMO job?